Description: This event is specially designed for Valentine's Day. 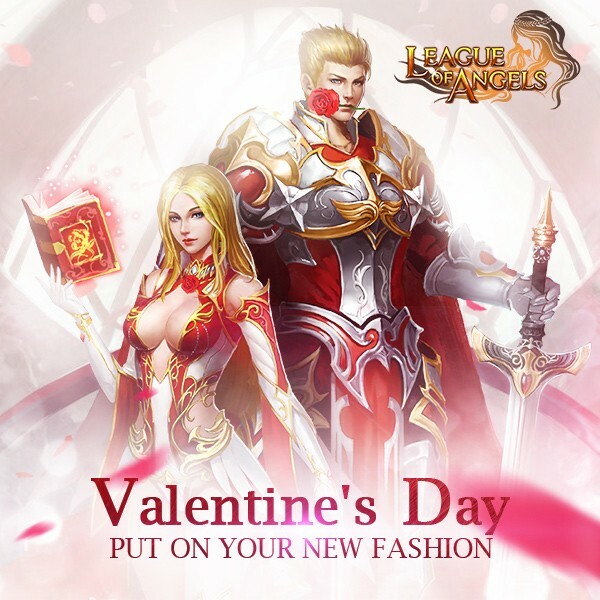 It will bring you big surprise and offer a great chance to win Angels, Mounts, Clothing, and many other items. 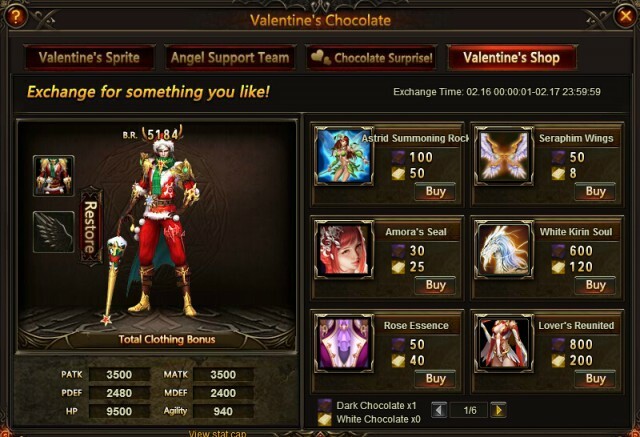 Valentine's Chocolate event consists of four parts, namely Valentine's Sprite, Angel Support Team, Chocolate Surprise, and Valentine's Shop. Here is the icon of Valentine's Chocolate. Astrid, the new fairy, is the Valentine's Sprite. Send Rainbow Candy to her and let her hide chocolate in certain scenes, you will receive 50 Valentine's Sprite Upgrade EXP. 1. Each server has one Valentine's Sprite. 2. 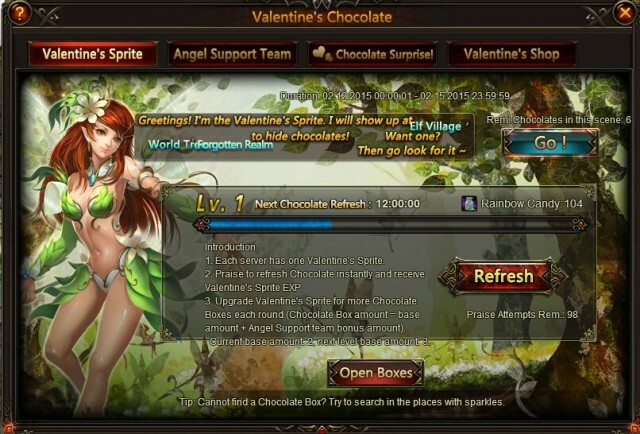 Praise to refresh Chocolate instantly and receive Valentine's Sprite EXP. 3. Upgrade Valentine's Sprite for more Chocolate Boxes each round (Chocolate Box amount = base amount + Angel Support team bonus amount). Click "Go!" button to find Chocolate Box in different places. Chocolate Boxes can be opened to get Dark Chocolate, Milk Chocolate and other resources. 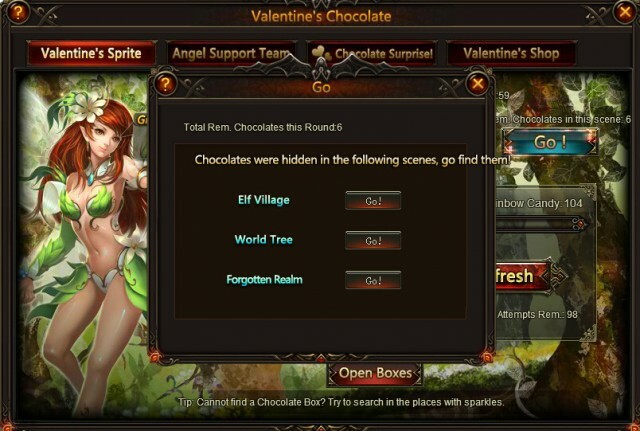 When you collect all the Chocolate Boxes in these three places, you can click "Refresh" button and boxes can be reset. Every Refresh requires 5 Rainbow Candies. Each refresh can add 50 Valentine's Sprite EXP. The higher Valentine's Sprite's level is, the more Chocolate Boxes she will hide. After you collect the boxes, please remember to open them by clicking "Open Boxes" button. 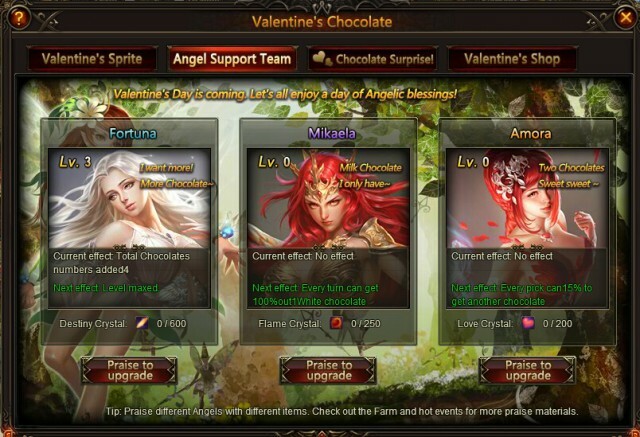 We invite three Angels (Fortuna, Mikaela, and Amora) to help you get more Chocolate Boxes. Each Angel has her own buff. Check out what the buffs are in game. Angel buff can be upgraded by using Destiny Crystal, Flame Crystal, and Love Crystal. All of these three resources can be gained by planting, and the seeds can be collected from hot events. Ps: Garden soil can be upgraded. Higher the soil grade, the greater the production, the shorter the harvest period. Open Chocolate Boxes here! 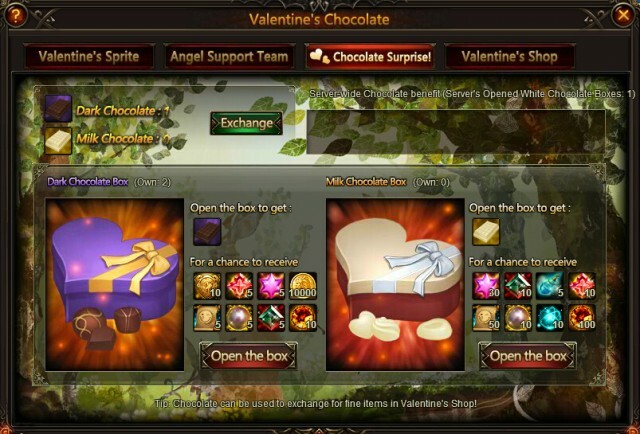 Chocolate can be used to exchange for fine items in Valentine's Shop. Check out what you want here, and know about how many chocolates you need to collect. In this way, you can make a wise plan for this event. 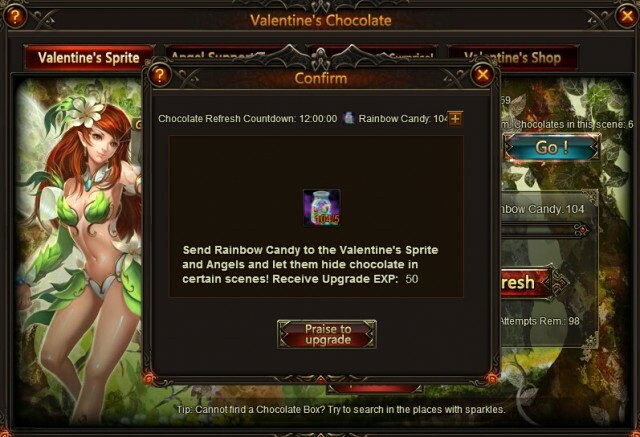 Description: Complete following tasks to collect Rainbow Candy and happy Valentine's Day! Description: Get Love Crystal Seed, Destiny Crystal Seed, and Flame Crystal Seed here. Plant them and harvest in Garden. Upgrade Angels' buff in Angel's Support Team tab.